Very well maintained spacious 2 bedroom/1.5 bathroom townhouse. On the ground floor is the open plan kitchen, living and dining, powder room and patio with lovely garden view. On the first floor are 2 air-conditioned bedrooms with one adjoining bathroom. The central pool facility and laundry room are just a few steps away. For the sports enthusiast there is access to the golf course and tennis courts. Rockley's central location makes finding your way to all amenities and beaches very easy. 10 minutes walk from peaceful Worthing Beach, 5 minutes walk from Barbados' largest supermarket. 0.75 mile from St Lawrence Gap, hub of Barbados nightlife with beachfront restaurants, bars and nightclubs, all in a secure, fenced environment which is patrolled during the hours of darkness. Please note, our rates are negotiable, please ask! Front door is guarded with locking cast iron security gate.On the ground floor is a fully equipped kitchen with microwave, coffee machine and large fridge freezer. in the lounge are comfortable seating for 6 people including sofa-bed, as well as dining table and chairs. there is a flat screen tv with satellite, DVD player, and broadband throughout the house. The patio, with patio furniture and gas barbeque look out onto the 1st fairway of Rockley golf course. Also on the ground floor is a powder room with lavatory. On the first floor are 2 large bedrooms that can be configured with either single or double beds.There is a "Jack & Jill" bathroom between them recently refurbished equipped with new shower. The main bedroom has a balcony which looks out onto the golf course and gets full sun in the morning, and is ideal for that morning cup of coffee. Both bedrooms are fully air-conditioned. 10 metres from the front door is the swimming pool, fully equipped with lounger beds, sun brollies etc. there is also a fully equipped laundry room with coin-operated washers and driers. approx 100 metres away is Rockleys own Birdies bar and restaurant, which boasts the cheapest Banks beer on the island, and can be recommended for its pizzas and coconut shrimp. They also put on live entertainment 2 or 3 nights a week in season, which can be great fun. Turn right outside Rockley Golf Club gates and within 200 years you reach Massy's, the largest supermarket on the island. Another 150 yards brings you to the coast road with plentiful supplies of buses and taxis, and peaceful Worthing beach on the other side of the road. if you turn left on the coast road, and travel along for a further half mile, you reach St Lawrence Gap, which is the entertainment centre of the South coast with bars, clubs and restaurants aplenty. Jack and Jill Bathroom located between the bedrooms with shower, handbasin and wc. Cooker, hob, fridge/freezer, microwave, toaster etc. Shared laundry room 10 yards from back door. Overlooking first fairway of Rockley Golf course, a tricky nine hole course of character, home of the Rockley Open. Notes on accommodation: Laundry room located 10 yards from back door with washing machines and driers operated by tokens available on site Outside: Patio and balcony with patio furniture overlooking gardens and first fairway with full size gas barbeque. Usually quiet pool (10 x 5 metres) shared with approx 25 other houses. Cleaning / Towels / Linen / Maid service: Maid cleaning service once a week. All linen and towels provided (changed weekly). Spacious house on Rockley Golf Course with open view looking out on the fairways, not crammed into a tiny space like so many others on the Island. House neat and clean with all facilities, pool 10 yards from front door. Like having our own private pool - there was never anyone else there! This bit of the Island is brilliant, half way between Bridgetown and the airport. 5 Mins walk to supermarket and lovely Worthing beach, 20 mins walk to St Lawrence gap. Loads of telly good restaurants and half the price of the West coast. Bar and restaurant on site, 50 yards away in clubhouse, with what they reckoned was the cheapest beer on the island. Free parking, on golf course if you fancy a knock. Owners even provide a set of clubs! Nice drive from main road to apartments. This was my first stay and not my last with my family. Apartment was very nice and clean. Spacious room for the six of us. Pool hours were perfect and was also close to my apartment, my kids had a blast everyday. The laundry room was just across the hall, you just have to make sure that you have your coins before the weekend as the office is close. Supermarket and beach is not far, even though we rented a car, we sometimes enjoyed the walk. I would highly recommend this place. Tony the owner, was very honest about his place , very patient and accommodating in helping us with our arrangements, we came in on the red eye flight and was able to check in right away. Thank you Tony for allowing us to rent your place. We had a blast! Great location, close to local amenities, beaches and restaurants. Lovely two bed apartment with access to pool. House was clean and had everything we needed for our stay. There are car parking spaces right outside if you plan to hire a vehicle. We had a great time using this as our base to explore Barbados. The golf course is in good condition if you fancy giving it a go. We would definitely recommend this place if you're looking to go to Barbados for your next holiday. 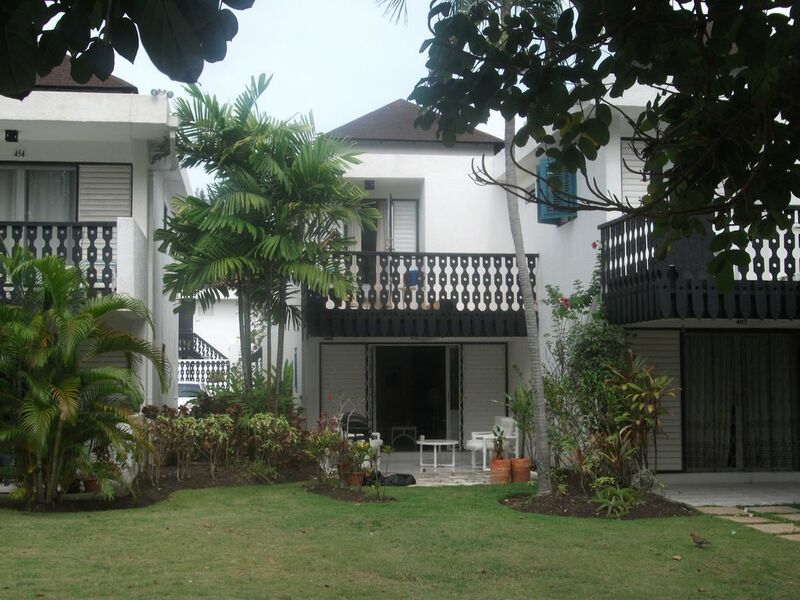 10 minutes walk from Worthing Beach and within half a mile of renowned Accra Beach. Under a mile from St Lawrence Gap. 7 miles from Grantley Adams Airport (approx 15-20 minutes by car). 3 miles from Bridgetown with regular bus services. 5 minutes walk from 'Massy superstore', one of the largest supermarkets on Barbados, banks etc. 0.75 mile from St Lawrence Gap, the hub of Barbados nightlife with top quality beachfront restaurants, bars and nightclubs. Booking Notes: Booking direct with owner. Deposit 25% on booking, balance payable one month prior to arrival. Changeover Day: Flexible changeover. Notes on prices: Prices are for the property weekly in UK pounds. Discounts available for periods over 1 week. Payment may also be made in US or BDS dollars.